My family is crazy for bread. They can't seem to get enough of it. We make some sort of bread every week and my kids take turns helping me. Punching the dough is the funnest part of course. My daughter helped me make this bread. When she was mixing the dry ingredients, I heard her say, "Two cups of SALT? Really?" I then realized that she was reading the directions wrong and wanted to add 2 cups flour, 2 cups sugar and 2 cups salt. Glad I was there to catch the mistake! We started over! 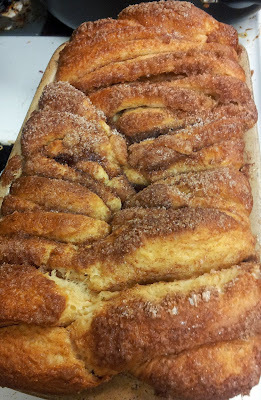 This month for The Secret Recipe Club I loved looking through Karens blog Cinnamon Freud. I was pleased as punch to find this awesome Cinnamon Pull Apart Bread. I knew that they family would absolutely love it! 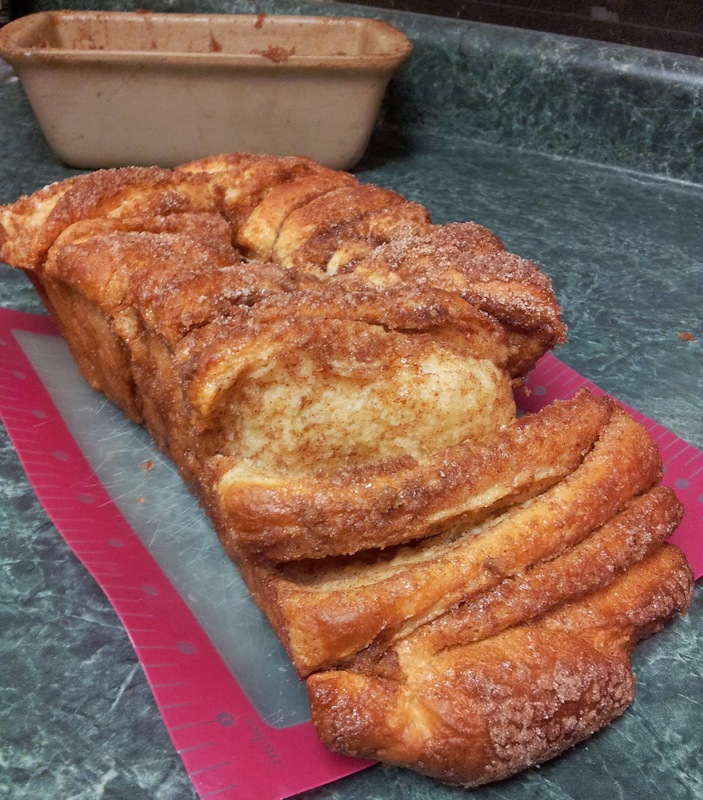 It was simple to make and the dough was really easy to work with. Everyone loved it and they can't wait to make it again! Thanks Karen for a fantastic recipe! In a saucepan combine milk and butter over medium heat. Stir together over heat until butter is melted. Let cool until mixture reaches 115-125°F. Stir in vanilla extract and 2 tablespoons water. Combine 3 tablespoons warm water and yeast with a pinch of sugar. Let sit until foamy, about 10 minutes. Pour the wet ingredients into the dry ingredients and mix until just combined. Add in eggs one at a time and mix until incorporated. Stir in 3/4 cup of flour and stir for 2 minutes. Place dough in a large greased bowl. Cover and let rise in a warm place until doubled in size, about 1 hour. In a small bowl mix together the sugar, light brown sugar, cinnamon, and salt for the filling. Melt the 2 ounces of butter for the filling in a saucepan over medium heat until it turns a brown, 5-10 minutes. Grease a 9 inch by 5 inch loaf pan. Set aside. Punch down the dough and knead in 2 tablespoons of flour. Cover and let rest for 5 minutes. Place on a lightly floured surface and roll dough out to a 12 inch by 20 inch long rectangle. Brush with melted brown butter. Sprinkle cinnamon sugar mixture on top. 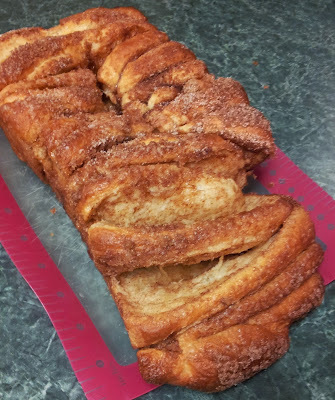 Slice dough into 6 vertical strips. Then cut into 6 horizontal strips to make 36 total strips. Layer the strips in the prepared loaf pan. Just kinda stack and layer them in there while the pan is tipped on its side. They don't have to be super neat, just push them in there. Cover and let rise in a warm place until almost doubled in size, 30-45 minutes. Bake for 30-35 minutes until golden brown. Run knife around the edges of pan. Invert onto a plate and flip back over. Serve warm.